It’s a fact that more and more homeowners are turning to glass to transform their bathrooms into mini-spas, Getaways and Retreats. M and M Glass wants to help bring that spa getaway right to your door through the ultimate shower or bath experience. Our trained glass installers provide the expertise, prompt service and creativity for your shower or bath design as you remodel or build your new home or makeover your existing one! 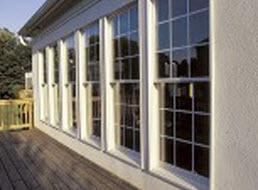 * Framed doors – the standard types found in many homes. 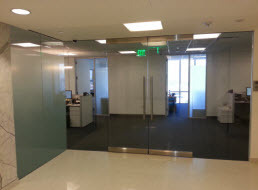 * Frameless doors – we install a unit with 3/8 inches of clear glass and wall mount hinges. * Shower doors with frosted glass – any size to custom fit your needs with any type of textured or timid glass. 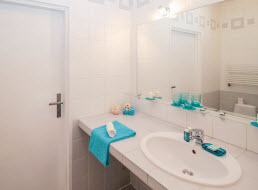 * We can also do shower, steam unit showers, or a tub. * Prices vary depending on the job and products that are needed. * If needed, we provide regular maintenance services to ensure the doors are durable and working to their potential. 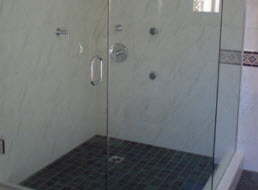 Custom shower enclosures require a great level of precision and expertise. Our experienced and detail oriented installers use lasers to measure each and every panel to ensure accuracy and a watertight seal. Each shower glass enclosure we install is truly a work of art. Contact M & M Glass to discuss your next frameless shower door, shower enclosure or other custom glass project today!